Adobo is a South American marinade or flavouring. This dish can be marinated in advance - it will help the flavours to develop. 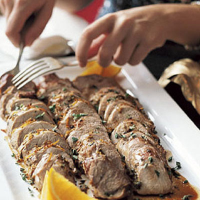 Pork fillet is ideal for this recipe but pork steaks or pork rack would also work well. Place the pork in a large shallow dish. Using a pestle and mortar, crush the garlic to form a paste, then add the cumin seeds and crush lightly. Spoon into a mixing bowl. Add the remaining ingredients, mix well and season. Pour the marinade over the pork, making sure that the fillets are completely coated. Cover and chill in the fridge for at least 2 hours or preferably overnight. Preheat the oven to 200°C, gas mark 6. Place the pork fillets in a large roasting tin (allowing space between each fillet). Cook for 35-40 minutes or until the juices run clear and there is no pink meat. Leave the pork to rest for 5 minutes before cutting into 2-3cm slices. Serve, drizzled with the juices from the roasting tin and garnished with wedges of orange and a sprinkling of chopped oregano. Prepare to the end of paragraph 2 of the instructions and leave the pork to marinate. Place the meat in the oven when you are about to eat your starter and it will be perfectly cooked in time for the main course.